September, the beginning of autumn, is a nice season to walk along the Kamo River.Especially, around the upstream of the river looks cool and refreshing. 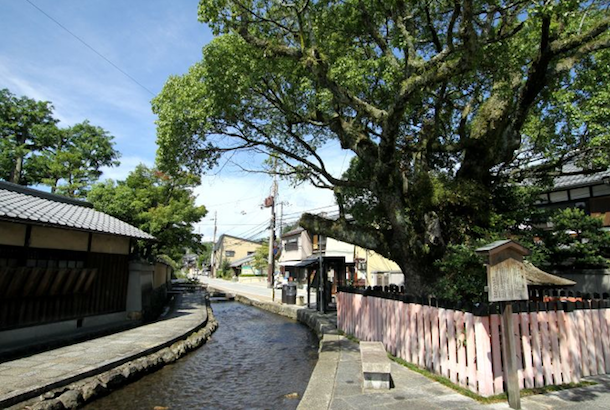 GTK recommends you to walk around the north part of Kamo River, in particular, the Kamigamo Shrine area. On September 9th, a unique event will be held in the shrine ground. This is one of the five celebrations for the changing season in Japan, also called “Chrysanthemum Festival“. You can see a unique sumo game by children, and also a chrysanthemum sake will be served. This sake is said to good for keeping our health. The east surrounding of Kamigamo Shrine is called Shake-cho (社家町), literally means the town of the residences for a Shinto priest, and recognized as a traditional building property. The appearance of the residence located along the river looks like a Samurai residence but the parts of inside feature the temple architecture. Approximately 20 residences remain (over 300 in the Edo Era) and some of them open their rooms and gardens to the public.